An Investor or End User's dream! Residence Six at 186 India Street is a special 1,158SF floor-through home with low carry, keyed elevator access, three bedrooms, two bathrooms, and two terraces featuring northern and southern exposures. The best deal for a three bedroom in Greenpoint or Long Island City!The layout of the home is ideal. Enter off the elevator into the foyer to the hallway that separates the master bedroom, second bedroom, and both bathrooms from the living space. A large walk-in coat closet and an LG washer/dryer are found along this hallway. Both bedrooms receive ample sunlight and are large enough to fit king sized beds. The master bedroom features an en-suite bathroom with a double vanity sink and shower. Sliding doors lead to a private, bright, south-facing terrace, perfect for lounging with enough space for dining and seating. The open living, dining, and kitchen area is bright and inviting. The kitchen features top of the line appliances from Bosch and custom cabinetry. Double sliding doors lead to another large terrace that is ideal for entertaining and outdoor dining. 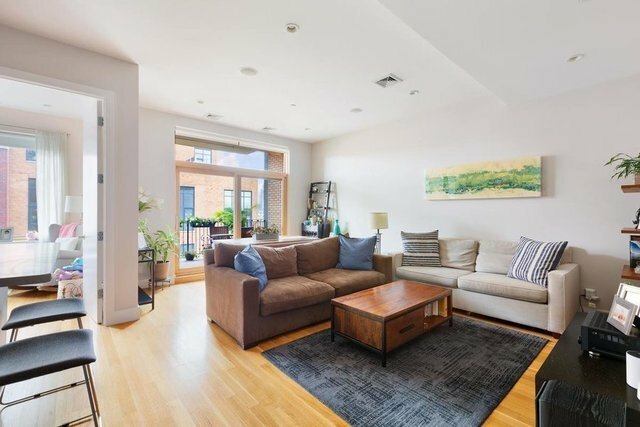 Additional features include radiant floor heating, video intercom, Nest central AC, and wood flooring throughout.186 India Street is a recently built condo building in Greenpoint ideally situated by the G train and ferry. Low common charges and real estate taxes due to the tax abatement in place until 2030 create a unique opportunity that won't last long!